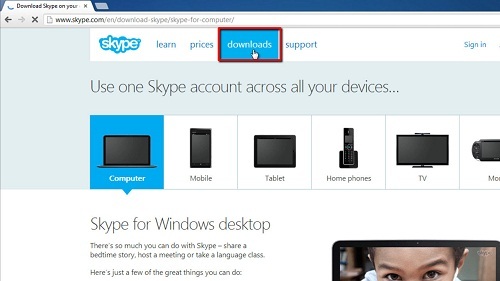 In this tutorial you are going to learn how to download Skype offline installer. Previously the “light” web installer was the default download, now the full installer is downloaded as the default and does not require an internet connection for installation. Open a web browser and navigate to the Skype website, “www.skype.com”. From the Skype homepage, navigate to the “downloads” page by clicking on the “downloads” menu item in the navigation menu found along the top of the page, just to the right of the Skype icon. The “downloads” page should automatically detect your device and show you a big green button about halfway down the page that says “Get Skype for Windows Desktop”. 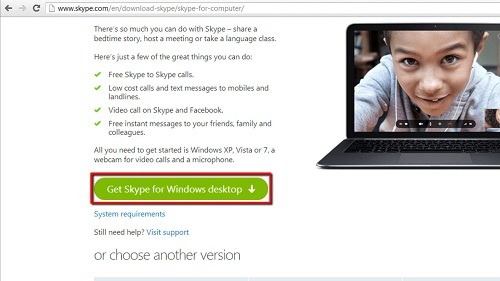 Click on the “Get Skype for Windows Desktop” button to start your download. Click on the “Save” button that appears in the pop-up window asking whether you want to “Save” or “Run” the download. This downloads the offline installer, “SkypeSetupFull.exe” to your disk. This is how to download Skype offline installer.